Dr Matthew Pope, of University College London, said the discovery provided new insights into the life of a thriving community of hunters at the site. 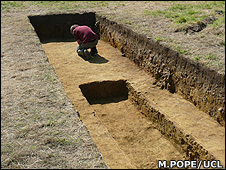 It is the first modern scientific investigation of the site since it was discovered in 1900. "It's exciting to think that there's a real possibility these were left by some of the last Neanderthal hunting groups to occupy northern Europe," said Dr Pope. "The impression they give is of a population in complete command of both landscape and natural raw materials with a flourishing technology - not a people on the edge of extinction." Some 2,300 stone tools were first uncovered at the start of the 20th Century when the foundations were being dug for a huge new house to be built at Beedings. But for many years, the tools were considered to be fakes. All but a few hundred of them were thrown down a well and never seen again. 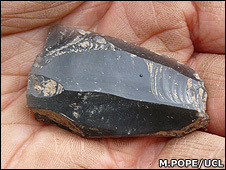 The tools were only recently recognised to be of international importance, following research by Roger Jacobi of the Ancient Human Occupation of Britain project. He demonstrated last year that the Beedings material showed strong resemblances to other tools from northern Europe dating to between 35,000 and 42,000 years ago. The latest finds now provided definitive proof that the original discovery was genuine, according to Dr Pope. "There were some questions about the validity of the earlier find, but our excavations have proved beyond doubt that the material discovered here was genuine and originated from fissures within the local sandstone." He said Neanderthal hunters were drawn to the hill over a long period of time, presumably for excellent views of the game herds grazing on the surrounding plains. His team now hopes to look for more sites with similar systems of fissures across other parts of south-east England. 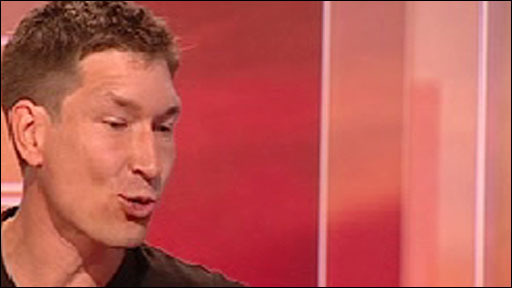 Barney Sloane, head of Historic Environment Commissions at English Heritage, said such sites were a rare and valuable archaeological resource. "Their remains sit at a key watershed in the evolutionary history of northern Europe. The tools at Beedings could equally be the signature of pioneer populations of modern humans, or traces of the last Neanderthal hunting groups to occupy the region. "This study offers a rare chance to answer some crucial questions about just how technologically advanced Neanderthals were, and how they compare with our own species."